Pete Sinibaldi posted 21 points and seven rebounds, Cole Lentz added 18 points and seven rebounds and South Williamsport outscored North Penn-Liberty by seven in the fourth quarter to earn a 61-46 win in boys basketball. Ethan Laudenslager totaled three points, five rebounds and six assists for the Mounties. Noah Spencer led NP-L with 15 points and Duncan Zeafla added 11. CMVT defeated Bucktail, 56-53. Devin Serafini scored a team-high 14 points for the Bucks and Richard Perry (12 points) and Gavin Becker (10) both scored in double figures as well. Sullivan County was held to two points in the first quarter and the offense sputtered as Millville defeated the Griffins, 56-17. Noah Rymsza recorded a double-double as Muncy defeated Benton, 54-31. Kolby Moyer led the Indians offense with 22 points as Rymsza scored 15 points and ten rebounds. Dylan Wilt was a point short of a double-double with nine points and 11 rebounds. • Montoursville defeated Selinsgrove, 59-39, in girls basketball as Lydia Albert and Madeline Adams led the Warriors with 20 and 17 points, respectively. MacKenzie Cohick added eight points and Kenna Mensinger added 11 rebounds. Karmen Short scored 23 points as Cowanesque Valley pulled out a 66-62 overtime win over Northeast Bradford. Makayla Vargeson finished with 16 points and Jessie Hummel added 13. Wellsboro beat Williamson, 52-20. Cathryn Brought led the Hornets with 11 points and Emma Poirier scored 10. Tamara Hess scored 20 points as Canton defeated North Penn-Liberty, 43-32. Hess added eight rebounds as Hailey Wesneski finished with six points and eight rebounds and Elle Binford scored seven points, eight rebounds and five steals. Eva Rice led Liberty with 14 points, Emma Williams and Taylor Thompson each had eight. Grace Kelleher scored 11 points as Lewisaburg defeated Hughesville, 24-12. Alex Snyder led Hughesville with four points. • Charles Crews scored a pivotal fall at 220 pounds to help Williamsport rally late and beat Danville, 42-31, in high school wrestling. The Millionaires led by just three points with three bouts to go when Crews scored his fall with just 13 seconds to go in the third period against Zack Zerbe. Ethan Williamson followed with a forfeit victory to clinch the win. 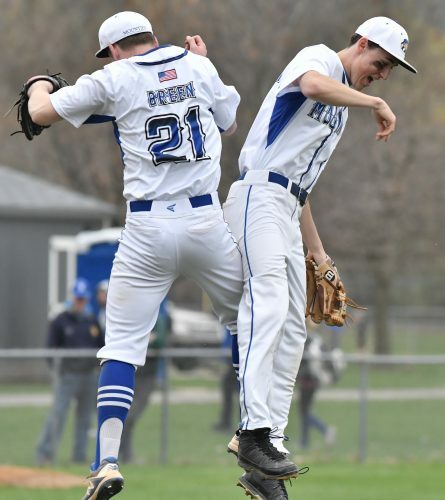 Braden Bower, Riley Bower and Carter Dawson picked up consecutive falls to help Williamsport jump to an early 21-3 lead. Montoursville went 2-2 at the Clearfield Duals on Saturday, beating Glendale (51-22) and Altoona (54-18) and falling to Forest Hills (48-36) and Clearfield (51-30). Wyatt DeWald picked up a pair of wins for the Warriors, scoring an 8-1 decision against Glendale and a 7-4 decision against Clearfield. • Penn College dropped an 81-51 loss to Morrisville State in women’s basketball. Kaylah Brown and Ariana Burke each had 11 points to lead the Wildcats as Ja’Quela Dyer added 10. Burke finished with nine rebounds and Borwn had three assists. • Penn College fell to Morrisville State, 103-82, in men’s basketball. Carson Garvis scored a team-high 29 points and Spencer Bartron added 19 points. Garvis led the Wildcats with seven of the team’s 27 rebounds. Garrett Cook hit four 3-pointers, but Mansfield lost to East Stroudsburg, 93-63. Cook paced the Mounties with 16 points. Tyler Moffe recorded 15 points and eight rebounds and Mike Rell added 12 points. • In women’s swimming, Lock Haven honored its trio of senior swimmers: Raechel Rodriguez Steph Parker and Carly Ray. All three swimmers won in relays and individuals, but Lock Haven fell to Kutztown, 125-90. Kristin Allen, Parker, Ray and Rodriguez won the 200 medley relay with a time of 1:57.99. Rodriguez won the 100 breast in a 1:09.46, Ray won the 50 free in 25.77 and Allen won a pair of individual events in the 200 fly (2:22.05) and 200 back (2:19.12). • Penn College fell to the College at Brockport, 37-9, in college wrestling. Daniel Bergeron put Penn College on the board with a 9-8 decision at 165 pounds and Dylan Gettys followed with an 8-3 decision at 174. Dylan Otis picked up Penn College’s final points with a double-overtime win at heavyweight. Kaylah Brown 4-18 1-2 11; Ariana Burke 5-8 1-2 11; Tori Wolfe 1-4 3-6 6; Maci Ilgen 0-8 5-6 5; Kiara Fry 1-3 1-2 3; Ja’Quela Dyer 3-9 3-4 10; Madison Klock 2-8 1-1 5. Totals 16-58 15-23 51. Charlotte Walker 13-21 1-1 28; Tori Rockefeller 7-11 1-2 19; Miranda Wright 4-4 0-0 10; Anna Raymond 3-8 2-3 10; A-laya Wright 2-8 0-0 6; Savannah Hobbie 1-1 1-1 3; Sierra Henry 1-12 1-3 3; Virginia Wheatley 0-3 2-2 2. Totals 31-68 8-12 81. 3-point goals: Penn College 4-19 (Brown 2-10, Wolfe 1-2, Ilgen 0-2, Dyer 1-3, Klock 0-2), Morrisville State 11-21 (Walker 1-2, Rockefeller 4-5, M. Wright 2-2, Raymond 2-4, A. Wright 2-5, Henry 0-3). Fouled out: Penn College-none, Morrisville State-none. Rebounds: Penn College 37 (Burke 9), Morrisville State 46 (A. Wright 12). Assists: Penn College 8 (Brown 3), Morrisville State 22 (A. Wright 7). Totals fouls: Penn College 11, Morrisville State 19. Technical fouls: Penn College-none, Morrisville State-none. A: 100. Carson Garvis 10-16 3-4 29; Spencer Bartron 7-14 1-1 19; Elijah Vazquez 4-11 0-0 10; Anthony Deitrick 3-8 1-2 7; Trey McCullough 2-5 0-0 4; Matthew Salvent 3-4 3-4 9; Brandon Fedoriw 1-3 0-0 2; Jordan Tyson 0-0 2-2 2; Frank Tuason 0-3 0-0 0. Totals 12-31 10-13 82. Kevin Dennis 13-17 6-8 32; Derek Beames 7-14 0-0 15; Rahmell Smith 5-10 1-2 14; Lamel Faison 3-9 3-5 9; Tyrin Miller 3-12 0-0 6; Justin Mitchell 7-9 1-1 16; Brison Hall 3-5 0-0 6; Jaylin Montalvo 1-3 0-0 2; Hunter Kowaleski 0-0 2-2 2; AJ Vernon 0-3 1-3 1; Jared D’Aloia 0-3 0-0 0. Totals 42-85 14-21 103. Halftime: Morrisville State, 52-42. 3-point goals: Penn College 12-31 (Garvis 6-10, Bartron 4-9, Vazquez 2-6, Deitrick 0-2, McCullough 0-2, Fedoriw 0-2), Morrisville State 5-18 (Beames 1-2, Smith 3-4, Faison 0-3, Miller 0-5, Mitchell 1-3, D’Aloia 0-1). Fouled out: Penn College-Garvis, Dietrick, Morrisville State-none. Rebounds: Penn College 27 (Garvis 7), Morrisville State 56 (Dennis 21). Assists: Penn College 20 (Salvent 3), Morrisville State 25 (Faison 8). Total fouls: Penn College 20, Morrisville State 10. Technical fouls: Penn College-none, Morrisville State-none. A: 200. Garrett Cook 5-7 2-2 16; Tyler Moffe 6-16 1-2 15; Mike Rell 5-10 1-2 12; Eli Alvin 4-8 1-2 11; Taylor Sweeney 2-7 0-0 5; Keith Farmer 2-4 0-2 4; Anthony McFall 0-2 0-0 0. Totals 24-54 5-10 63. Nick Giordano 9-16 0-0 23; Josh Williams 9-11 2-2 21; Ryan Smith 8-10 1-2 17; Jakwan Jones 3-6 0-2 6; Montrel Morgan 1-5 0-0 3; Shamir Johnson 3-7 2-2 8; Michal Weiss 2-3 0-0 4; Mike Millsip 2-2 0-0 4; Troy Jones 1-4 0-0 3; Jacob Godfrey 1-1 1-2 3; Steven Stoney 0-2 1-2 1; Ish Horn 0-3 0-0 0. Totals 39-70 7-12 93. Halftime: East Stroudsburg, 39-27. 3-point goals: Mansfield 10-23 (Cook 4-6, Moffe 2-3, Rell 1-3, Alvin 2-2, Sweeney 1-5, Farmer 0-2, McFall 0-2), East Stroudsburg 8-27 (Giordano 5-10, Williams 1-2, Smith 0-1, J. Jones 0-2, Morgan 1-3, Johnson 0-2, T. Jones 1-4, Stoney 0-1, Horn 0-2). Fouled out: Mansfield-none, East Stroudsburg-none. Rebounds: Mansfield 31 (Moffe, Sweeney 8), East Strousburg 35 (Williams 7). Assists: Mansfield 11 (Moffe 4), East Stroudsburg 25 (J. Jones 8). Total fouls: Mansfield 9, East Stroudsburg 11. Technical fouls: Mansfield-none, East Stroudsburg-none. A: 950. 200 IM relay: Lock Haven (Kristen Allen, Steph Parker, Carly Ray, Raechel Rodriguez), 1:57.99. 1650 free: Lindsay Brenneman, KU, 19:17.67. 200 free: Emmarose Decaro, KU, 2:05.82. 100 back: Claire Frank, KU, 1:03.9. 100 breast: Raechel Rodriguez, LHU, 1:09.46. 200 fly: Kristin Allen, LHU, 2:22.05. 50 free: Carly Ray, LHU, 25.77. 100 free: Becky Nothstein, LHU, 56.74. 200 back: Kristen Allen, LHU, 2:19.12. 200 breast: Charlotte Owens, KU, 2:41.88. 500 free: Allison McLaughlin, KU, 5:34.11. 100 fly Lindsay Brenneman, KU, 1:02.28. 400 IM: Linnea Pierson, KU, 5:09.65. 200 free relay: Lock Haven (Kirsten Pugh, Raechel Rodriguez, Kristin Allen, Kandace Loup), 1:48.91. 100 free: Carly Ray, LHU, 56.24. 125: Matt Caccamise (B), forfeit. 133: Donald McCoy (B) pinned Colin Jens, 2:51. 141: Zack Barker (B) dec. Cameron Dickey, 9-5. 149: Ryan Snow (B) major dec. Jesse Walker, 17-4. 157: Zack Brown (B) pinned Makeela Fabrizio, 2:48. 165: Daniel Bergeron (PCT) dec. Jackson Bell, 9-8. 174: Dylan Gettys (PCT) dec. Tim Collins, 8-3. 184: Bryce Rowe (B) pinned Colin Browne, 2:08. 197: Joe Yanis (B) pinned Jared Mooney, 4:53. 285: Dylan Otis (PCT) dec. Calik Kennedy, 3-1 (SV-2). Noah Spencer 5 3-3 15; Duncan Zeafla 4 0-0 11; Brandon Thompson 3 0-1 6; Logan Horsley 3 2-2 8; Nick Grinnell 1 1-2 4; Brandyn Choplosky 1 0-0 2. Totals 17 6-8 46. Ethan Laudenslager 0 3-4 3; AJ Flick 2 2-2 6; Cole Lentz 7 3-4 18; Pete Sinibaldi 10 1-3 21; Nate Persun 1 1-1 3; Ryan Weinhoffer 2 0-2 4; Fransisco Logera 2 2-2 6. Totals 24 12-18 61. 3-point goals: N.P.-Liberty 6 (Zeafla 3, Spencer 2, Grinnell 1), South Williamsport 1 (Lentz 1). JV score: N.P.-Liberty won, 48-43. Records: North Penn-Liberty (13-7), South Williamsport (9-11). Next game: North Penn-Liberty at Canton, Monday, 6 p.m.; Muncy at South Williamsport, Tuesday, 6 p.m.
Michael Starr 3 3-5 9; Cole Simpler 10 3-12 25; Kenny Churd 2 0-2 5; Norman Verbach 1 0-2 2; Gabe Earnest 5 5-13 15. Totals 21 11-32 56. Devin Serafini 6 0-0 14; Richard Perry 6 0-0 12; Gavin Becker 4 0-2 10; Dylan Cross 1 0-0 2; Alex Intallura 1 1-45 3; Gabe Conway 1 4-10 6; Liam Dwyer 0 2-2 2; Zach Pick 2 0-0 4. Totals 20 7-19 53. 3-point goals: CMVT 3 (Simpler 2, Churd 1), Bucktail 4 (Serafini 2, Becker 2). Records: Bucktail (6-12). Next game: Muncy at Bucktail, Monday, 6 p.m.
Justin Metzger 1 0-1 3; Omar Rubio 0 1-2 1; Jalen Thomas 1 2-2 4; Jessie Williams 1 0-0 2; Trace Neary 1 0-0 3; Sam Carpenter 1 0-0 2; Dylan Hottenstein 0 2-2 2. Totals 5 5-7 17. Clinton Smith 2 0-0 5; Sawyer Watts 8 1-3 17; Drew Shultz 2 1-2 5; Tyler Johnson 5 1-2 11; Will Holdren 2 5-8 10; Dane Robbins 4 0-0 8. Totals 23 8-15 56. 3-point goals: Sullivan County 2 (Metzger 1, Neary 1), Millville 2 (Smith 1, Holdren 1). JV score: Millville won, 46-43. Records: Sullivan County (9-10). Next game: Wyalusing at Sullivan County, Tuesday, 6 p.m.
Kyle Lenhart 2 0-1 4; Dylan Wilt 4 1-4 9; Noah Rymsza 3 8-17 15; Max Rymsza 1 2-2 4; Kolby Moyer 8 0-0 22. Totals 18 11-24 54. Nate Watson 2 1-2 5; Josh Remley 3 0-0 6; Derek Buck 1 0-2 2; Leland Bogart 1 2-2 4; Lucas Acornley 2 0-0 4; Braden Shires 1 0-0 2; Tristan Brown 2 0-0 6; Jacob Martin 1 0-2 22. Totals 13 3-10 31. 3-point goals: Muncy 7 (Moyer 6, N. Rymsza), Benton 2 (Brown). JV score: Muncy won, 28-24. Top scorer: MäErnie Coppes, Joe Edkin 7. Record: Muncy (9-10). Next: Muncy at Bucktail, Monday, 6. Marley Sprenkel 1 2-4 4; Leyi Gabrielson 1 2-2 5; Avery Defazio 1 2-2 5; Veronica Stanford 0 2-2 2; Lydia Geipel 0 0-1 0; Anna Piecuch 4 5-8 13; Cierra Adams 0 1-2 3; Becky Gingrich 1 5-6 7. Totals 7 19-27 39. Maddie Probst 1 0-0 2; Allyse Marchioni 2 0-0 4; Kenna Mensinger 0 3-6 3; MacKenzie Cohick 4 0-2 8; Lydia Albert 7 5-10 20; Toni James 2 1-2 5; Madeline Adams 5 3-4 17. Totals 20 13-24 59. 3-point goals: Selinsgrove 1 (Defazio), Montoursville 5 (Adams 4, Albert). 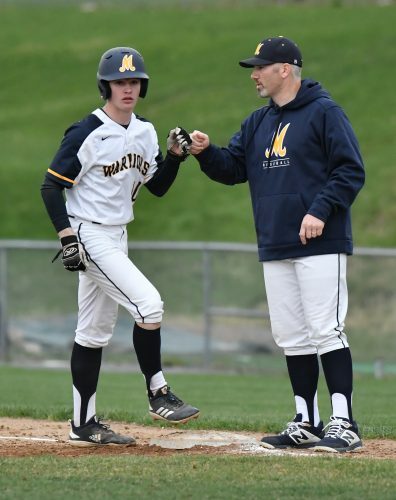 Records: Montoursville (7-14). Next game: Milton at Montoursville, Wednesday, 6 p.m.
Jorga Welch 2 0-0 4; Lauryn Jones 5 2-2 15; Maisie Neuber 1 0-0 2; Lindsay Moore 5 0-0 14; Aaliyah Bevaqua 6 2-4 14; Vickie Rought 6 1-4 13. Totals 25 5-10 62. Kailey Wells 3 1-3 9; Delaney Doan 1 0-1 2; Makayla Vargeson 6 3-6 16; MiKarra Allen 1 1-2 3; Karmen Short 10 3-6 23; Jessie Hummel 4 5-6 13. Totals 25 12-24 66. 3-point goals: NEB 7 (Moore 4, Jones 3), CV 4 (Wells 2, Vargeson 2). Jena Boyce 2 1-4 5; Catherine Brought 5 0-0 11; Emma Poirier 4 2-2 10; Lauren Singer 1 0-0 2; Heidi Zuchowski 3 0-0 6; Bailey Monks 4 0-0 8; Liza Manning 4 0-0 8; Kiyah Boyce 1 0-2 2. Totals 24 3-8 52. Ella Durst 2 0-2 5; Keira McCormick 1 0-1 2; Santana Bradshaw 0 0-2 0; Lakeisha Peterason 4 2-3 13; Abby Root 0 0-1 0. Totals 7 2-8 20. 3-point goals: Wellsboro 1 (Brought 1), Williamson 4 (Peterson 3, Durst 1). Records: Wellsboro (12-9), Williamson (1-15). Eva Rice 5 1-1 14; Taelyn Brown 1 0-0 2; Emma Williams 4 0-0 8; Taylor Thompson 3 2-2 8. Totals 13 3-3 32. Elle Binford 3 1-2 7; Tamara Hess 5 7-9 20; Hailey Wesneski 1 4-6 6; Courtney Weiskopff 5 0-0 10. Totals 14 12-17 43. 3-point goals: North Penn-Liberty 3 (Rice), Canton 3 (Hess). Records: North Penn-Liberty (1-17), Canton (10-11). Next game: Canton at Troy, Monday, 6 p.m.
Cierra Getz 0 0-2 0; Alex Snyder 2 0-2 4; Jade Cordrey 1 1-2 3; Lauren Henry 1 1-2 3; Olivia Strother 0 2-6 2. Totals 4 4-14 12. Grace Kelleher 2 7-7 11; Erin Hilkert 1 0-0 2; Sydney Hoffman 3 0-0 7; Roz Noone 0 1-4 1; Jamie Fedorjaka 1 0-0 3. Totals 7 8-11 24. 3-point goals: Lewisburg 2 (Hoffman 1, Fedorjaka 1). Records: Hughesville (10-10), Lewisburg (13-8). Next game: CMVT at Hughesville; Milton at Lewisburg, Moday, 6 p.m.
113: Landon Hopper, D, dec. Riley Harris, 10-7. 120: Braden Bower, W, pinned Breaden Sarviss, 1:06. 126: Riley Bower, W, pinned Logan Walters, :39. 132: Carter Dawson, W, pinned Conner Jones, 1:25. 138: Roman Morrone, W, dec. Dared Dewalt, 7-4. 145: Kaden Kurzawa, D, pinned Tylil James, :15. 152: Owen Mahon, W, dec. Evan Welliver, 6-2. 160: Anthony Robinson, W, won by forfeit. 170: Eric Sees, D, won by forfeit. 182: Mike Cook, D, pinned Cale Cooklin, 2:25. 195: Matt Dunkle, D, pinned Dade Splain, 5:53. 220: Charles Crews, W, pinned Zack Zerbe, 5:47. 285: Ethan Williamson, W, won by forfeit. 106: Andrew Johnson, D, maj. dec. Austin Stugart, 13-2. 160: Ryan Latshaw, FH, pinned Caleb Moser, 2:53. 170: Gavin Livermore, M, pinned Corey Miller, 1:59. 182: Dylan Bennett, M, pinned Mason Rodgers, 1:27. 195: Gable Crebs, M, won by forfeit. 220: Cameron Wood, M, won by forfeit. 285: Lane Stutzman, M, won by forfeit. 106: Easton Toth, FH, pinned Kayden Frame, 3:07. 113: Jackson Arrington, FH, pinned Xan Oberheim, 1:21. 120: Michael Noon, FH, pinned Broc Lutz, 3:23. 126: Byron Daubert, FH, pinned Lucas Sherwood, 1:55. 132: Garet Connor, FH, pinned Dominica Daugherty, 2:58. 138: Eric Gibson, FH, pinned Wyatt DeWald, :48. 145: Robert Krug, FH, pinned Jake Dinges, 3:03. 152: Cael Crebs, M, inj. def. Ryan Weyandt. 182: Dylan Bennett, M, pinned Brett Zattoni, 3:04. 195: Gable Crebs, M, pinned Oliver Billotte, :49. 220: Nick Domico, C, pinned Lane Stutzman, 1:59. 285: Cameron Wood, M, pinned Avry Gisewhite, 1:10. 106: Jonathan Thomas, C, dec. Kayden Frame, 10-4. 113: Nolan Barr, C, pinned Xan Oberheim, 1:38. 120: Broc Lutz, M, pinned Derrick Bender, 1:14. 126: Karson Kline, C, pinned Lucas Sherwood, 1:58. 132: Luke Freeland, C, pinned Dominica Daugherty, 1:07. 138: Jude Pallo, C, pinned Wyatt DeWald, 1:12. 145: Caleb Freeland, C, pinned Jake Dinges, :58. 152: Cole Smay, C, pinned Emery Balint, 1:25. 160: Cael Crebs, M, won by forfeit. 170: Mark McGonigal, C, won by forfeit. 195: Gable Crebs, M, won by forfeit. 220: Cameron Wood, M, dec. Cory Johnston, 3-2. 285: Kyle Jasper, G, pinned Sawyer O’Connor, 1:12. 106: Suds Dubler, G, pinned Kayden Frame, 5:49. 113: Garret Misiura, G, maj. dec. Xan Oberheim, 11-0. 120: Broc Lutz, M, pinned Evan Duclo, :22. 126: Brock McMillen, G, pinned Lucas Sherwood, 1:10. 132: Dominica Daugherty, M, won by forfeit. 138: Wyatt DeWald, M, dec. Ethan Cavalet, 8-1. 145: Jake Dinges, M, dec. Cameron Fyock, 12-5. 152: Cael Crebs, M, won by forfeit. 160: Caleb Moser, M, pinned Boston Bloom, :28. 170: Dylan Bennett, M, won by forfeit. 182: Gavin Livermore, M, won by forfeit. 106: Kayden Frame, M, pinned Jordan Carlucci. 113: Luke Hileman, A, pinned Xan Oberheim. 120: Broc Lutz, M, dec. Damion Finnegan, 9-4. 126: Matt Sarbo, A, pinned Lucas Sherwood. 132: Dominica Daugherty, M, won by forfeit. 138: Wyatt DeWald, M, dec. Graham Black, 7-4. 145: Jake Dinges, M, pinned Andrew Beach. 152: Emery Balint, M, pinned Gavin Wagner. 160: Cael Crebs, M, pinned Adam Zerbee. 170: Dylan Bennett, M, pinned Colin Allmond. 182: Joshua Keirn, A, pinned Gavin Livermore. 195: Double forfeit. 220: Gable Crebs, M, pinned Shamus Walker. 285: Cameron Wood, M, pinned Trevor Manley.